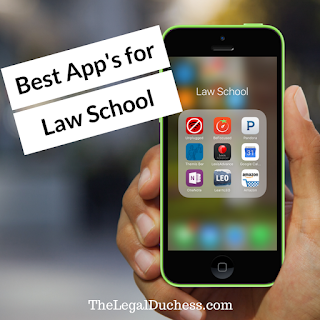 Law School is very much in a modern, technological age. I have yet to need to enter the library and actually use the books, most of my assignments are due online and I take computer notes in all but 2 classes. 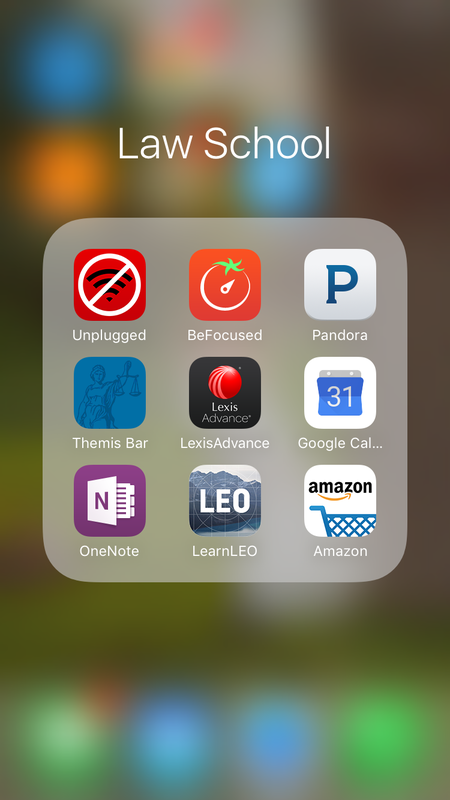 As a result of this digital age, I have found several applications that are absolutely necessary to help me in Law School. This is an app that helps to monitor how much I get on my cell phone. It keeps track of how many times I pick up my phone and this helps me to be aware of how much time I waste on Instagram and twitter when I should be studying. This is along the same line as the previous app but it integrates the Pomodoro method for timing. The Pomodoro method is 25 minutes of full-on, hard-core studying followed by a 5-minute break. After a few rotations, it gives you a longer 30-minute break. This is great for keeping on track and focused. Instead of checking facebook right then, I save it for my break. After 25 minutes, my brain is due for a break and that is just what this method gives you. It is a scientifically formulated study method and it works wonders for me. This app just times out the Pomodoro and gives you alerts when it's time to study or time for a break. Though this is primarily a Bar Prep service, they offer 1L information that I find very helpful. My favorite thing is the short videos on the subjects you learn your first year. I download subjects I struggle with onto my phone and listen to them while driving to and from class. It is an easy way to sink the information just a bit deeper into my brain. If you are a Law Student, you know the importance and necessity of Lexis. I keep the app on my phone for quick look ups or if I need two cases at once. Sometimes you just need Lexis at your fingertips. This, along with my planner, keeps my sanity intact. I keep all classes, assignments, due dates, meetings and anything else I have going on in this and it syncs through my computer and iPhone. I always know where I need to be. It also sends alerts before events to remind you or to remind you of due dates. Life. Saver. I have talked extensively about Microsoft OneNote and my deep, abiding love for it. I have all my notes, blog post ideas, to-do lists, Christmas lists and pretty much my whole life in OneNote. It syncs throughout my computer, iPhone and iPad automatically so I always have my information ready to go. I never have to worry about losing my notes because I can also access it online. I love having it on my phone for when an idea strikes me suddenly and I am not around paper or my computer or to study on the go or while waiting at the doctor's office. Another study tool I have found super useful. All my 1L books are on this site and they have the cases imported. So I can go into my Torts book and find the Palsgraf case in just seconds on my phone. It also features quizzes, outlines and various other study tools to help you be successful as a 1L. As a Law Student, I honestly have no time to shop around or run errands beyond the grocery store. I love having Amazon Student Prime because I get free 2-day shipping and I can order anything I need in just a few clicks on my phone. I use this to reorder pens, highlighters, when I need a yellow scarf for the Homecoming Game super last minute, a spice rack, etc. The possibilities are endless and it is so convenient. Other bonuses from Prime Student is Amazon music (more great study playlists as well as fun music for other times), Amazon Video for when you finish your homework and the ease of shipping your books. What App's help you through Law School?